Gwinnett Recycles citizen volunteers recently took a guided tour of Gwinnett’s best kept recycling secret: The Snellville Recycling Center. 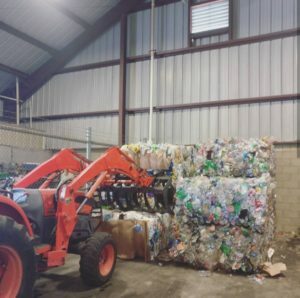 Located at 2531 Marigold Road, off of Lenora Church Road in Briscoe Park, the center accepts a wide variety of items for recycling from both Snellville and non-Snellville residents. In a county that currently has no other recycling drop-off center, a visit here feels exciting and special. Wherever you are in Gwinnett, it’s worth the drive. 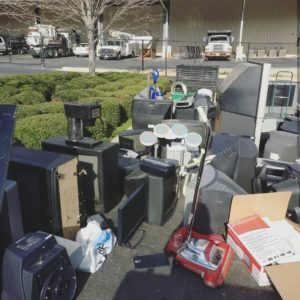 The standout items on this list, which can otherwise be challenging to recycle in and around Gwinnett, are glass, electronics of ALL kinds (anything with a battery or a cord), and carpet pad. Though not listed on their website, we also found that the center was accepting household batteries of all kinds; usable housewares, furniture, and sporting goods for donation. Large appliances, such as washers, dryers, refrigerators, dehumidifiers, air conditioning units, and freezers are accepted for a small fee. Broken lawn mowers, bicycles, and certain appliances are set out at the front of the center for interested parties to take and repair. Scrap metal accepted includes non-ferrous metals, such as brass, copper, nickel, and aluminum (including window screens and storm doors), as well as ferrous metals such as steel, stainless steel, and cast iron. Aerosol cans and food cans are not accepted. 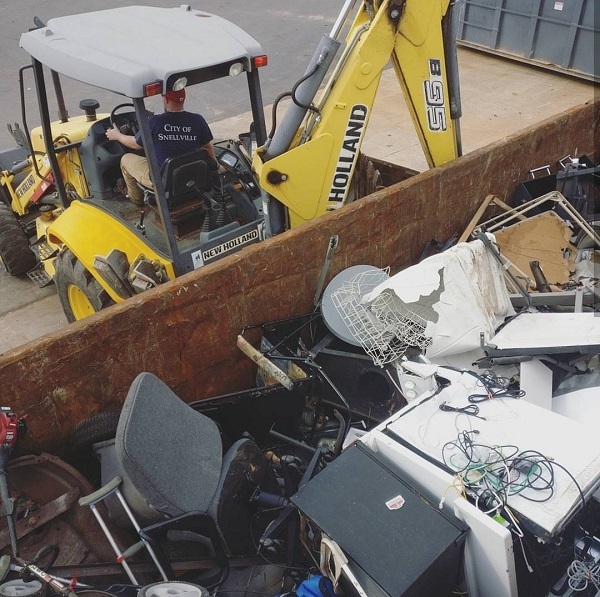 Payments are not offered for scrap metal, so if you have a lot to recycle, you may want to take your metal to one of the many metal recyclers in Gwinnett County for a rebate. So, what services at the center are limited to residents of the City of Snellville? Residential junk, such as broken furniture and old mattresses, is accepted for disposal only from city residents, who are limited to one truckload to the recycling center per day at no cost. Residents may also drop off one truckload of yard trimmings per day. However, anyone may pick up mulched yard waste for free if they shovel it themselves, or for a small fee if they would like the assistance of the center’s backhoe. If you need to recycle plastics #3-7, chemicals, paint, bulbs, or tires, the Snellville Recycling Center can’t help. For just about anything else, the center is a wonderful option generously provided by the City of Snellville. While you’re there, check out the guardhouse — made of 100% recycled materials — and say hello to Dale, our friendly tour guide. 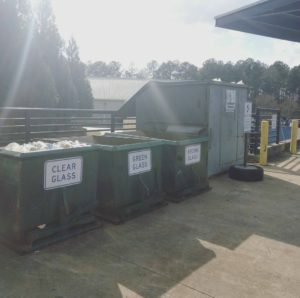 Want to be part of the next Gwinnett Recycles facility tour? Subscribe to our newsletter for updates! Are you recycling glass? And are you accepting from ANY gwinnett county resident? If you are, what are your hours? Thank you. Do you accept plastic grocery bags for recycling?